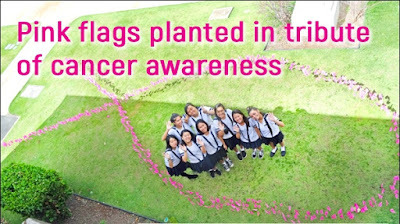 For Breast Cancer Awareness Month observed in October, the High School Student Council spearheaded a special effort recently to increase knowledge of this health ailment, which primarily affects women. 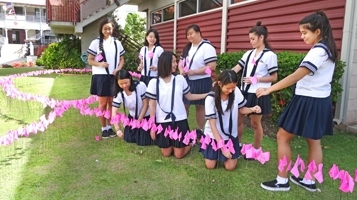 Lower and High School students were given bright pink flags, on which they wrote a prayer, encouraging quote or the name of a loved one impacted by breast cancer. Over the fall break, members of the Council planted these flags near the Performing Arts Center - in the shape of a commemorative ribbon - to spark continued awareness and dialogue about Breast Cancer.